Fatima Al Ali first started playing hockey in the United Arab Emirates, she skated with young children half her size. When Fatima Al Ali first started playing hockey in the United Arab Emirates, she skated with young children half her size. “They were looking up at me like, `What is she doing here?”’ she said. On Wednesday, she was halfway around the world skating with the NHL’s Washington Capitals, and they knew exactly what she was doing there. Capitals great Peter Bondra was impressed by Al Ali’s advanced stickhandling moves during a visit to Abu Dhabi, and the team flew her to the United States to meet her favorite player, Alex Ovechkin, during the league’s “Hockey is for Everyone” month. The 27-year-old Al Ali only began playing hockey six years ago after falling in love with the sport as the official photographer for the men’s national team, and now she’s among the best players on the women’s team in the United Arab Emirates. According to the International Ice Hockey Federation, the UAE has only 82 adult women’s players among its 802 skaters and just nine rinks in the country of almost 6 million where the average winter temperature is about 79 degrees. Al Ali recently got punched in the face while breaking up a fight as a referee but finished the game. She’s a hockey player, all right, with skills that could probably earn her a spot on women’s club team in North America. She has had a busy week. After visiting the National Mall and seeing sights around the nation’s capital Monday with her brother, Mohammed, Al Ali took in the Wizards’ overtime thriller against LeBron James and the NBA-champion Cleveland Cavaliers at night and visited the UAE embassy and met ambassador Yousef Al Otaiba on Tuesday. Overwhelmed by her first trip to Washington, she cried in the Capitals’ locker room Tuesday night as she met players after their game. She found some comfort on the ice with them Wednesday. As cameras from about a dozen media outlets documented her every stride, Al Ali talked about herself, the sport in the Middle East and stick curves and different moves. “I was so nervous going on the ice, but once we started talking it just calmed down,” she said. 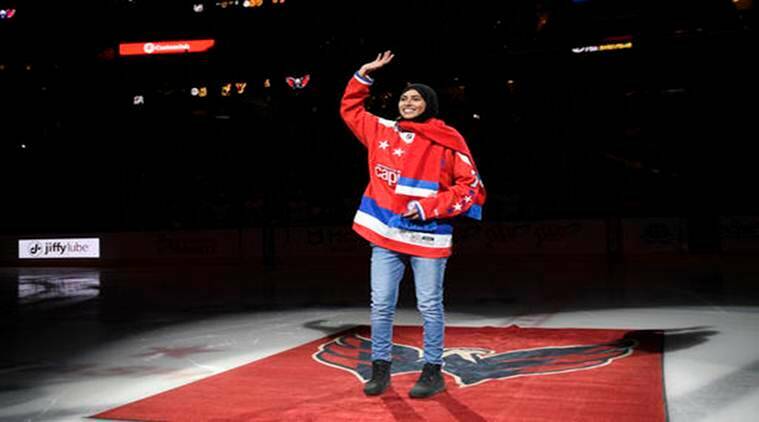 “We’re just talking about hockey, something we all share and something we all love.” On Thursday, she did the ceremonial puck drop at the Capitals-Red Wings game. Al Ali got a signed stick from Ovechkin to commemorate her visit. Ovechkin also hopes she takes home more motivation to play and spread the sport. During his trip to Abu Dhabi, Bondra met with UAE hockey officials and coached an under-18 practice. He said hockey is on the way in a very nontraditional market. Al Ali is at the forefront of that on the women’s side, and Pavlikovsky said nine or 10 more players from her team want to participate in their next camp run by former NHL and European players. That’s the impact she hopes to have. 3 India junior hockey World Cup winning team meets former great Balbir Singh Sr.